On February 17th, at approximately 8.45 the first invader arrived at 'het Trefpunt' in Maarssen. He was soon joined by the other invaders and at 10.00 the buildup was well underway. By the time the general assembly of members of the HCC Commodore ig was finished, most of the gear was hooked up and the Invasion started. The museum rack was back again. 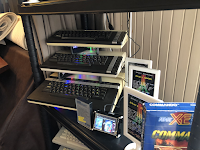 This year we had it filled with our custom Atari homecomputer stands, one with XL computers, the other with XE machines. 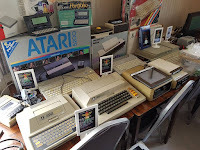 A light sixer with Quelle's Universum keyboard, a Lynx and 7800 on another shelve and finally an 800 and the Sears Tele-Games. Next to the museum our custom display case was filled with a broad range of home-brew items for the 2600, 7800 and 8bit range of Atari systems. We brought along some binders, books and magazines. The podcast station - an old tablet with the 'retro atari podcast' app - was not used at all, unfortunately. Something we also didn't put to use was the preservation area. We will continue the preservation work in the comfort of our homes. Our boxed collection of Atari gear did attract many visitors and so did our gaming area, where we had 8-bit gear hooked up to a large screen. The falcon finally got past its desktop and we had it run some STE demos and games. The Jaguar did get some play time, although Rayman proved to be rather hard for most players. We promised to show some modern gear which got sidetracked, because the owner of the MISTer had to attend family matters and we didn't get around to setup our emulation system. At the staging area(s), which were manned by IvoP and Level42, they showed the latest version of their projects: SNES2Joy and MIDI Muse from Ivo and Level42 brought an 800XL with his switchable ANTIC prototype. 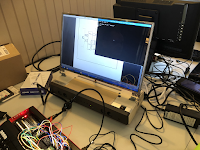 It was great to see that other visitors of the Commodore club meeting brought their own Atari gear and we were amazed to see the project by one of the regular hardware hackers: He put a Raspberry Pi inside a 1027 printer. Even though some of our experiments failed, others seemed very successful. All in all we think the 3rd Invasion was a big success thanks to all that participated! 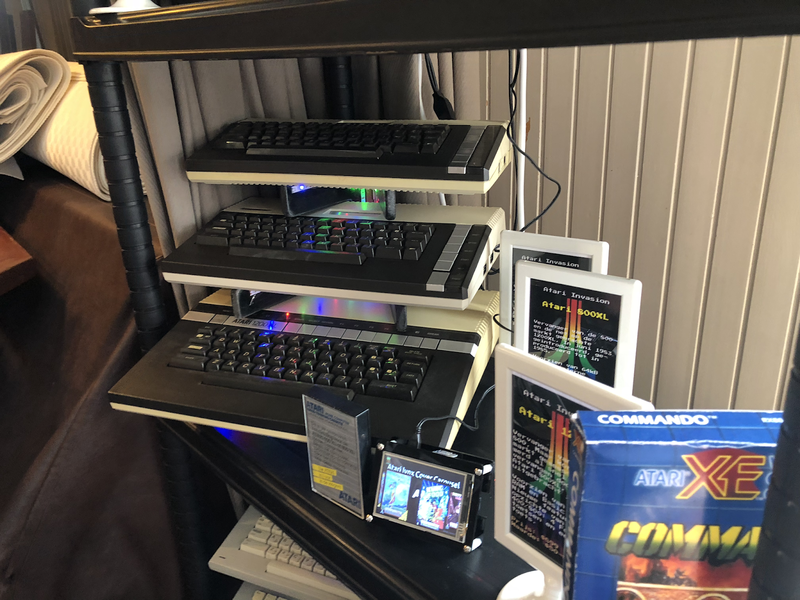 We would like to thank the HCC Commodore sig, better known as Commodore Club Nederland, for their continued support and making enough space available for us! If it's up to us, we'll be back next year, with new experiments and more improvements. For now we leave with a line from the old Arari commercials: Have you played Atari today?